blank text box while resourced? Having just read the card text, I thought "That's really good! How come I haven't seen it or heard too much about it?". The above post answers that question. Very potent. 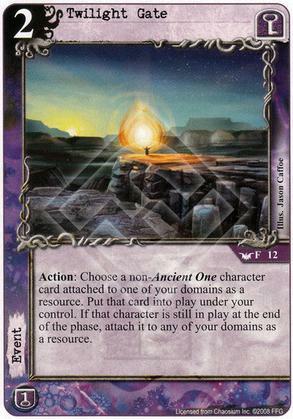 There are plenty of non-ancient ones that can have a massive influence on the game, and it doesn't even specify Yog. Then there's the resource movement and ramping you can get afterwards. A card to build a deck around for sure. Well, it's restricted for a reason. Dumping out some ridiculous fatty with a nice enters/leaves play ability (or even just a great activated one) on turn 1 or 2 is absurd. It also allows for some resource ramp and/or smoothing by shifting around resources. You have to tailor your deck around it, but it's generally worth it. Any ambush effect has to be respected and this is one of the best. Being able to choose from a selection of characters is awesome, a nice fatty or come into play effect will ruin your opponents day. It can also be used to gain an attacker or to manipulate your domains. A very versatile card. What happens if the character leaves play during the phase it was brought into play by Twilight Gate. Will it still return to your domains or stay in the discard pile or in your hand or wherever he ended up? Ah, ignore my question. It would help to actually read the card.